Were you invited to be a bridesmaid or godmother? Do not know what to wear to be elegant in the event? I made a "basic" wishlist with wedding party dresses: inspirations for bridesmaid and godmother for you! It is always great to have one or more party dresses in the wardrobe for use in weddings, 15 years, birthdays and other parties, because we never know when we will be invited! Or even with the invitation in hand, the question arises of which party dress to wear in that celebration to which we were invited. For this, I put together this wishlist with party dresses from the Dresslily store. They are party dresses of varying colors, patterns, designs and sizes, which I'm sure will appeal to you. Let's check out various models of party dresses? Tiffany Blue is one of the brides' favorite colors for the wedding. Many brides adhere to the tiffany blue color for wedding decoration, for party favors, invitations, and even for the bridesmaid dress. Come to think of it, I chose this gorgeous tiffany blue dress to inspire the novias that want to choose this color. And if you have any questions about color, read: What's the difference between Tiffany Blue and Tiffany Green? (Yes, there is a difference between blue tiffany and green tiffany - that does not even exist!). What draws attention to this tiffany blue bridesmaid dress is the short-sleeved model, where the bust is covered in lace, bringing just below a silver-tongued belt. Beautiful and charming the look of this party dress, in addition to very jovial. Bordeaux are a color used in weddings, and do you know why? Because, most of the time, it is confused with the marsala color (the color of the year 2015: PANTONE 18-1438 Marsala). Being a color so similar to marsala, the confusion between colors is certain, but the charm and sophistication in marriage, are guaranteed! 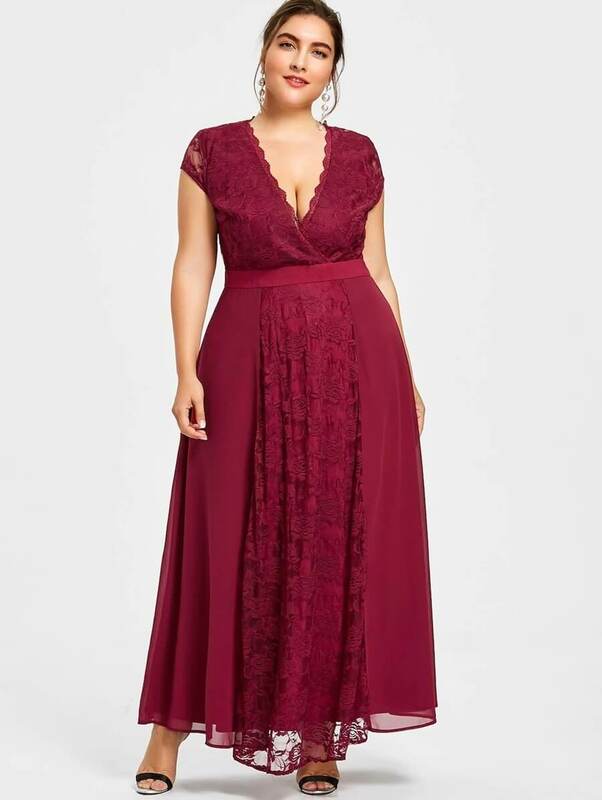 So when I put together my wishlist from the Dresslily store, I've included a burgundy dress to inspire the notions that think about choosing this color for their bridesmaids. The bordeaux bridesmaid dress marked on the waist with satin ribbon, gives a whole charm to the piece of this wedding party dress. The lace up side and the chiffon skirt complete the super stylish and beautiful look. Another color that is widely used in bridesmaid dresses is burgundy, and this should, once again, be a color that is very similar to the marsala. So, so that there is no more confusion between these colors, you can check and answer your questions here: What is the difference between marsala, bordeaux and burgundy? The beauty of the burgundy dress I chose to compose my wish list is wordless ... The lace of the bust, superimposed also on the middle part of the front of the maid of honor dress is beautiful and sophisticated, leaving any woman elegant and ready to destroy. The color green is not used much in weddings, so I recommend it to escape from what we commonly see. The green with its nuances will bring a lot of beauty, of course, to your wedding. To check, you can access this example here: Emerald Green Wedding and/or Greenery Wedding to prove how green is an exotic and beautiful color for weddings. The emerald green dress I chose is a model very similar to the burgundy dress. What differs from the two bridesmaid dresses is the lace worn on each dress. However, both are beautiful dresses and worthy of a bridesmaid who will look beautiful at the wedding of her girlfriend friend. Black is a color that never goes out of style, does it? And thinking about it, I chose to show off a beautiful black dress from the Dresslily store. The maid of honor party dress features chiffon skirt and lace bust. The contrasting white belt gives a whole charm to the model of the dress for godmothers. 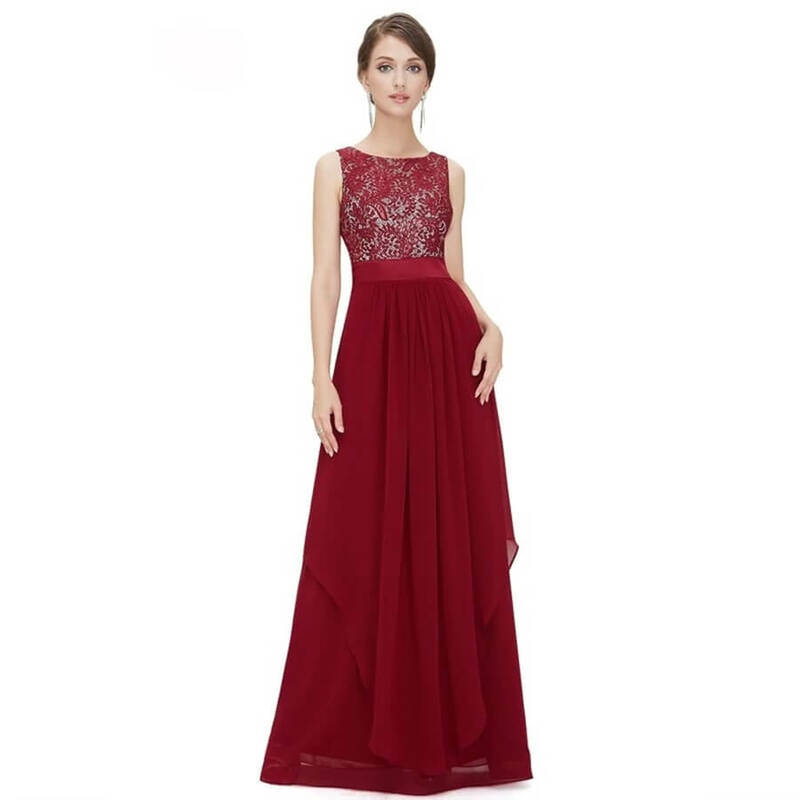 Certainly, you will look beautiful and elegant at the ceremony and reception, as the model of the party dress is a classic. Very different from anything we see around here, the tribal can also invade and color the wedding. A wedding party dress with a tribal print will be something unusual and very chic at the same time. 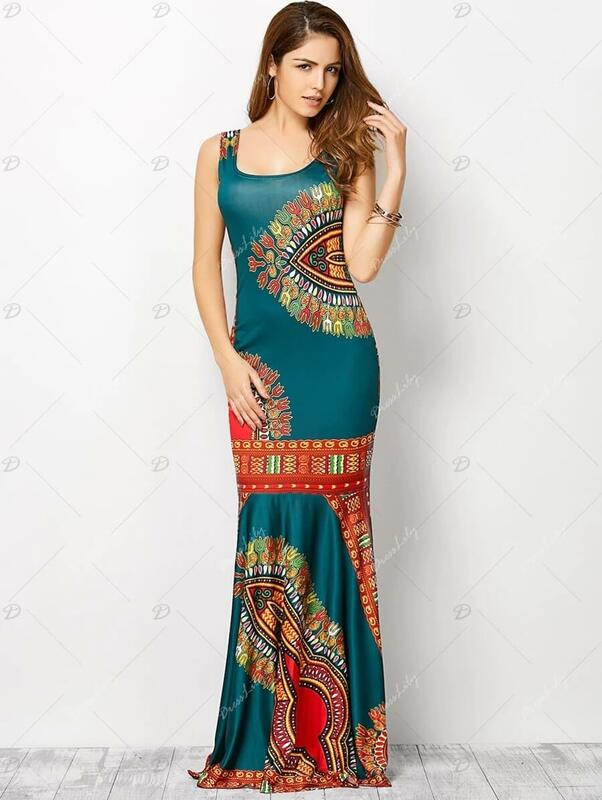 So, I chose this super different tribal dress model to make up my wish list for Dresslily, because for a daytime outdoor wedding, I found this super-trendy party dress model right for the occasion. Black is a joker color that we should all have in our wardrobe, because its elegance round every space. 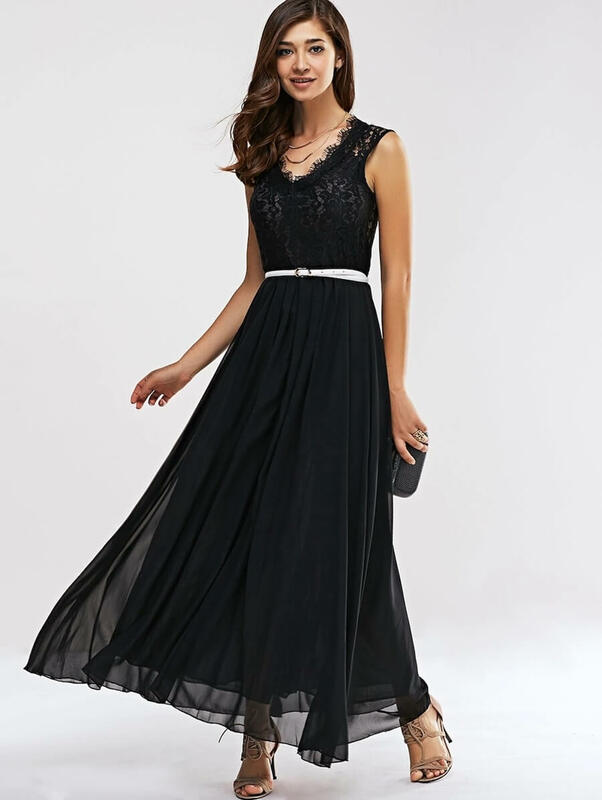 Having a black party dress is something essential to integrate a wedding look or any other parties. So, I chose this black mermaid dress as the inspiration for a maid of honor's dress, because her refined and chic model will be the key to becoming beautiful on the altar on the day of her bride's wedding. What about ombre? Folks, it's a tone color on gradient tone that super fits into a modern wedding. I have spoken here on the blog about ombre wedding. The ombre may appear in pastel tones or stronger colors. The multicolored ombre dress I chose is a model that, although simple, at the same time denotes a unique subtlety and sophistication. Another little color used in weddings is violet. However, it is a beautiful and exotic color. and that was chosen this year by Pantone: Ultra Violet, the color of the year Pantone 2018 18-3838. This ultra violet dress is a very simple model, but despite its simplicity, brings a unique softness for the moment. As I mentioned, ombre is a modern and beautiful style that brings a harmonious look and super different from what we usually see around. Bridesmaids and bridesmaids look beautiful wearing ombré as we can see here: Ombre Bridesmaid Dresses. This black and blue ombre dress is a fine example of sophistication and beauty. The model of this one-shoulder party dress brings brilliance and a gorgeous fabric in black and blue ombre. And then did you like the bridesmaid dresses and bridesmaid dresses I chose to show you? If you want, view more Dresslily dresses.